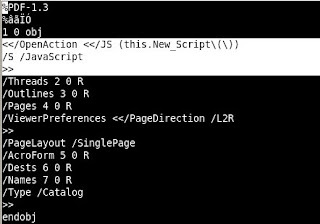 GoTo: put the application focus on other part of the document. GoToR: put the application focus on other part of a document different to the actual one. GoToE: it allows to redirect from/to a embedded PDF file. Launch: it executes an applications or read or print a document. Thread: it jumps to an article within the document. URI: with this action it's possible to access to web pages or remote resources. Sound: it plays the specified sound. Movie: it plays the specified movie. Hide: it's an action that hides or shows the specified annotation/s. Named: it executes an action predefined by the PDF reader. SubmitForm: it sends the existent form data to a given URL. ResetForm: this action changes the values of the form fields to default. ImportData: the function of this action is to import data from a file to the document. SetOCGState: it sets the state of a group of optional components (graphic elements located in the document). Rendition: it controls the reproduction of multimedia content. Trans: this action allows to control the graphic transition between several actions. GoTo3DView: it identifies a 3D annotation and specifies a type of view to use. The trigger of these actions is variable, depending on their location which is used to be an annotation or any object in the document outline. In these cases the action follows the /A element and it's executed when the container object is activated. They can also be located within an annotation, in a page or in an interactive form field following the /AA (Additional Actions) element and their execution depends on the chosen options. This way it's possible to execute actions when the mouse enters or exits from an annotation part, when certain page of the document is being viewed, or when the value of a form field is modified, among others. As well it's possible to execute an action when we open the document through the /OpenAction element, located in the document catalog. As you can see the actions are very powerful. This post wanted to be an introduction to the execution of actions in a PDF document, in next posts I'll try to explain some of them from a practical perspective.